Several people have asked me how I produced the visualizations that I used in my talk on del.icio.us. While those visualizations were constructed with a rather eclectic mixture of homebrewed code, assorted applications, and a good bit of elbow grease, I decided to put together a tutorial for people who might be interested in this type of visual exploration, but are not inclined to write custom Perl code to do so. Hence, I have selected a combination of two very nice applications for Mac OS X - Anthracite and OmniGraffle - to produce similar visualizations. Neither application is free, but both have free trial periods, should you be inclined to check them out. 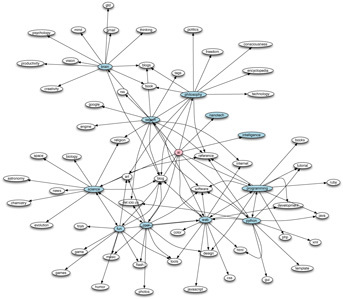 As an alternative to OmniGraffle, the excellent open source program Graphviz may be used, although it is less user-friendly than OmniGraffle. Finally, since the files that will be produced by Anthracite are in a simple text-based format (known as the dot format), a good text editor might come in handy for those people who want to modify these files by hand - TextWrangler is an excellent and powerful text editor, and is available for free. run OmniGraffle to create the actual graph. Instructions for doing this are found on the following pages. You will also need to rename one of the files (dotfile.txt), as described in part 3 before using it in OmniGraffle. It is important to note that the preprocessor and processor programs overwrite their output files every time they are run, since they are intended as "scratch files" - if you wish to keep them, you should rename them or move them to a different directory. The first line tells the program reading the file that the graph is of the digraph type, i.e., a graph in which nodes (the tags from del.icio.us in our scenario) are connected by directed edges (lines with arrows on them), and is titled delicious. The next two lines tell the program how nodes 1, 2, etc. should be drawn, and in what color. node1, node2, etc are the labels that will identify nodes in our final diagram. The three lines following those tell the program what nodes to connect with arrows. Thus, the first line of this type states "draw an arrow from node1 to node3, another arrow from node1 to node4, and a third arrow from node1 to node17". While the dot file format has many more options, this subset will suffice for our goals - for those people interested in some of these options, multiple documents are available on the Graphviz site.